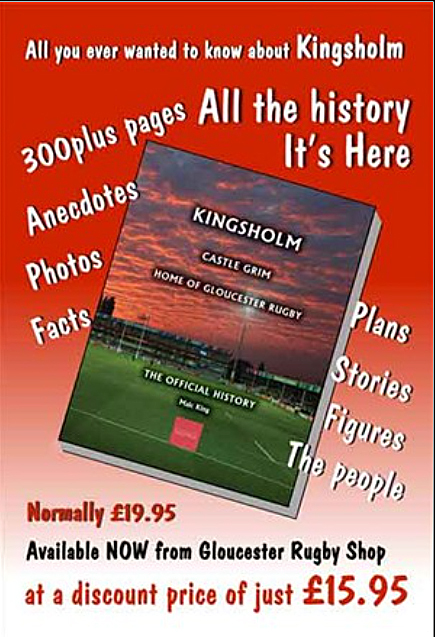 The history of Kingsholm over the first 125 years of rugby at the ground, produced by the Gloucester Rugby Heritage Project and for sale now at a price that is aimed at allowing us, as a charity, to break even on the sales. It covers the ground’s origin as Castle Grim, how it came to be purchased and its development into a modern stadium. This large format, high quality, hardback book is rich in original documents, illustrations and quotes from those most closely associated with the ground. Read interesting stories of characters and events which have shaped the evolution of the ground – about the first groundsman and his horse, balloon launches in Victorian times, what happened during the two world wars, how the main stand burned down, the development of the Tump and the Shed, and changed of ownership in the professional era – and much, much more. For Club, King and Country. 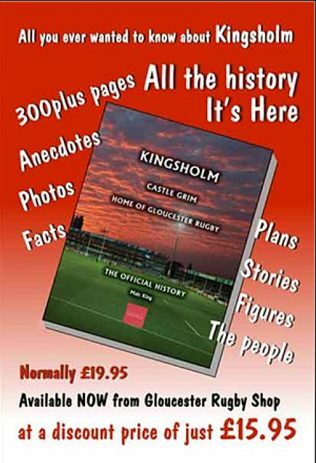 Gloucester Rugby Heritage - The Book.